Left over Islamic State’s improvised explosive device killed a civilian in Al-Jumaili neighborhood of the city of Raqqa. Two families clashed in the village of Al-Dana, after a dispute regarding “the sound of an electric generator” between the two families escalated. According to reports, two individuals were killed from one of the two families, which resulted in the other family burning three shops owned by the first family. The clashes between the two continue across Al-Dana, as Hayat Tahrir al-Sham is absent from the locality. Left over Islamic State’s improvised explosive device killed a civilian in the village of Maksar al-Hissan village in eastern Homs. 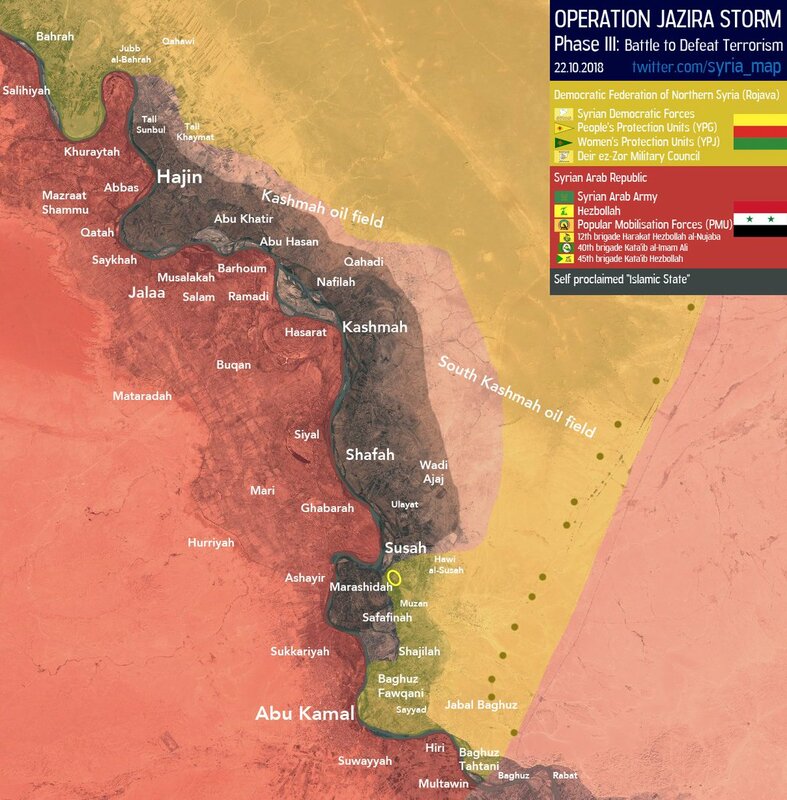 Syrian Democratic Forces launched an attack and captured half of Al-Sousse (Al-Susah) village from the Islamic State, as clashes between the two still continue in the locality. 1-Al-Bagouz axis: Terrorists of Deash tried to attack the positions of our forces, and then violent engagements broke out, and our artillery bombed the positions of the terrorists. The front saw engagements with PKc and RPG when the terrorists tried to attack our positions with Dushka weapons from several sides, while calm returned to the lines of contact between our fighters and a terrorist. Despite attempts by terrorists to disrupt the advance of our fighters, our forces continued to advance, our fighters managed to destroy a terrorist tunnel, and one of the international coalition aircraft carried out air strikes against the Daesh sites, where four terrorists were killed in those strikes. In the direction of Al-Sousse, our fighters managed to advance in one axis, and 17 points were installed. The terrorists tried to block the advance of our forces by detonating a car bomb that resulted in two of our fighters being promoted to martyrdom and wounding 3 others. As a result, our fighters closed down all the secondary roads leading to that area. In the context of the battle between our forces and a terrorist in the vicinity of the town of Sousse, our forces hastened the terrorist organization and launched a surprise attack on their fortifications inside the town and engaged them directly in their strongholds. The clashes, which began in the early hours of the morning, continue with the marked advance of our forces inside the Sousse and the retreat of the terrorists into the town. As part of the continuous fighting in AL-Sousse, our forces-controlled half of the town. 2-Hajin axis: The thunderstorm in the region last night led to the explosion of three mines planted by the terrorists in the vicinity of the positions of our forces without any injuries. 3- Al-Bahra axis: Terrorists fired two missiles at one of our military vehicles loaded with Dushka’s weapon, which caused damage without any of our fighters. It was followed by mortar fire on the positions of our fighters without causing any harm. The area witnessed enemy movements, where our forces targeted these movements, and an international coalition fighter carried out two air strikes on terrorist positions on that axis. In the context of the follow-up and meticulous pursuit by our special units in the “battle to defeat terrorism”, especially in the area of ​​securing the liberated villages, our forces were able to explore and dismantle a large number of mines and explosives planted by the terrorist organization in the vicinity of the village of al- Abu Hammam) near the town of Bahra. The seized and dismantled explosives were multiple types of mines and in large quantities, which the terrorist organization had planted on the ordinary roads used by people in their daily lives, taking advantage of the dust storm that hit the region earlier, to inflict the greatest harm on people and massacres of villagers. Two families; Al-Halisat and Al-Sadhan clashed in the village of Al-Kasra, after a dispute between the two families escalated. According to reports, three individuals were wounded in the clashes, before the Syrian Democratic Forces’ Internal Security Forces intervened and arrested seven individuals involved in the clashes. Afghan National Security Forces allegedly killed 79, wounded 84, and arrested three elements of the Islamic Emirate of Afghanistan (Taliban) in Imam Sahib district, according to the Afghan Ministry of Defense. Islamic Emirate of Afghanistan’s Al-Emarah News stated that 11 elements of the Afghan National Security Forces were killed and 13 wounded in clashes in Imam Sahib district. Islamic Emirate of Afghanistan’s Al-Emarah News claimed that the group took control of Yangi Qala district and all of its checkpoints from the Afghan National Security Forces. According to Al-Emarah News, 22 elements of the Afghan National Security Forces were killed and 25 wounded in the encounters. Afghan National Security Forces killed six elements of the Islamic Emirate of Afghanistan in Pol-e Khomri district. Afghan National Security Forces killed 11 and wounded four elements of the Islamic Emirate of Afghanistan, as well as destroyed several weapons depots and ammunition caches in Asmar and Chapa Dara districts. Afghan National Security Forces reportedly killed 11 and wounded 13 elements of the Islamic Emirate of Afghanistan in Ghazni district. Islamic Emirate of Afghanistan’s improvised explosive device destroyed an Afghan National Army’s armored personnel carrier, killing three and wounding two soldiers in Bazargan area of Shah Joy district. Afghan National Security Forces killed six and wounded one element of the Islamic Emirate of Afghanistan in Nad Ali and Garmsir districts. Islamic Emirate of Afghanistan ambushed an Afghan National Army’s convoy, reportedly destroying three vehicles and killing ten soldiers in Tanwchi area of Miyanishin district. Two Islamic Emirate of Afghanistan’s improvised explosive devices destroyed two Afghan National Army’s armored personnel carriers, killing five and wounding several soldiers in Shah Wali Kot district.